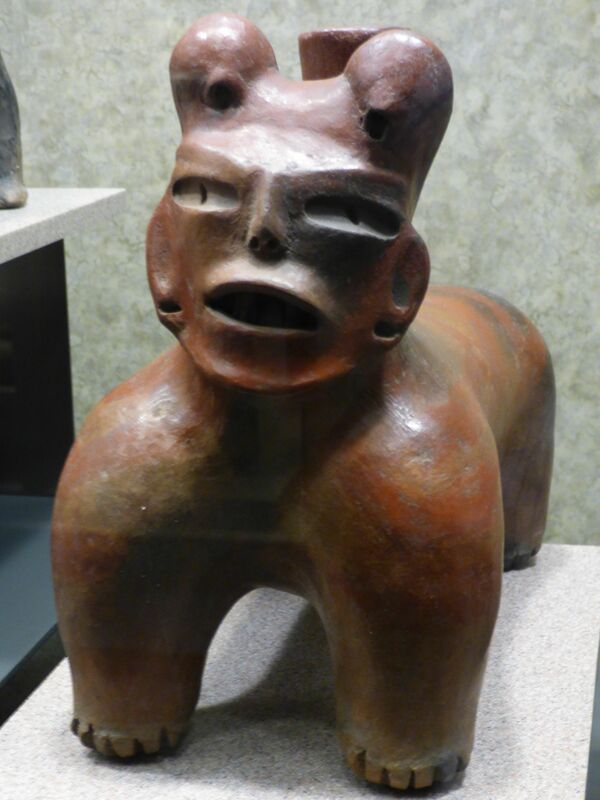 Dogs (such as this one, in the Museum of Anthropology, Mexico City) guided their people to the next world in Aztec culture. I wrote once before about Juan Rulfo and his novel Pedro Paramo, which has unparalleled status in Mexican literature and was a major influence on the young Gabriel García Márquez on his arrival in Mexico City in 1961. I recently spent an evening reading Juan Rulfo’s short stories El llano en llama (translated into English both as The Plain in Flames and The Burning Plain). The stories were written in the long wake of the Mexican revolution, which coincided with Rulfo’s own childhood in an orphanage in Jalisco where, he said later, he often saw corpses hanging from posts, and that he spent all his time reading, “because you couldn’t go out for fear of getting shot.” These stories lead the reader into a space of silence and mystery, where reality breaks down and we enter a world that might be the antechamber to the afterlife, if the afterlife you have in mind is bleak, featureless, devoid of anything that could pass as life at all. But there are ghosts, at least. The rhythms of Rulfo’s prose remind me of what Octavio Paz wrote about his archetypal Mexican: “his language is full of reticences, of metaphors and allusions, of unfinished phrases, while his silence is full of tints, folds, thunderheads, sudden rainbows, indecipherable threats . . .” There are threats aplenty, but they are unformed, vaguely defined and usually at some distance from the place of narration – yet always getting closer. Events take place in a half-light, as characters stumble towards yet another failure, or else death. In another story ‘Don’t you hear the dogs barking’, a man carries his adult son on his back to try and find a doctor in the town of Tonaya. The younger man is wounded. It is night-time and the old man cannot see where he is going. As the pair draw near to the town we learn through the father’s faltering monologue that his son is a thief and a murderer, and he is only carrying him out of respect for the boy’s dead mother. In these two stories, the barking of dogs indicates the existence, if not of hope precisely, then of some form of life, of human dwellings at the very least. But perhaps that is a false reading. In Mesoamerican cultures dogs were considered to have the powers to guide the dead to a new life after death, which explains why dogs have frequently been found buried with people in pre-Columbian sites. And of course, at the end of Malcolm Lowry’s masterpiece, Under the Volcano, a dead dog is thrown down the ravine after the dead body of the unfortunate consul. To come full circle, I discovered today that Rulfo had a bit-part in a Spanish film based on a short story by Gabriel García Márquez. The film is called En este pueblo no hay ladrones (In this town there are no thieves), and is exceptional in that the cast is made up of notable writers, visual artists and film directors, including Luis Buñuel (clearly relishing his performance as the town priest), Leonora Carrington, Arturo Ripstein, Alfonso Arao, Abel Quezada, and Gabriel García Márquez himself. 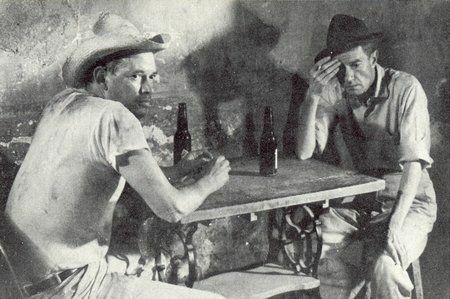 Juan Rulfo (left) and Abel Quezada having a beer, in a scene from ‘En este pueblo no hay ladrones’ based on a short story by Gabriel García Márquez. I don’t always find time for reading your pieces when you post them, but they are there for me when the waters part and I can walk out. I am reading Marquez again, so this is timely info to keep me busy learning. I look forward to Juan Rulfo now. Thank you (again). I am slightly apprehensive about reading Marquez again – I tried 100 years of solitude last year and I realised i could never recapture the amazement I felt when i read it x years ago. Rulfo is much darker. Thanks for your comment. Interesting tidbit about Rulfo acting. Crossing the windswept plain between Puebla and Xalapa always reminds me of Rulfo’s stories even though he was writing about Jalisco and environs. I’m envious of your travels. Hi Tom, nice to hear from you. I have a way to go yet . . .